The Oakland Peace Center makes its home in the First Christian Church of Oakland, an imposing Mission Revival structure in a residential neighborhood of this California city. Completed in 1928, it has arched doors and windows and red stone embellishments. The 40,000-square-foot building spreads out over five levels. The exterior still resembles the grand church it once was. But inside, there are signs that the First Christian Church congregation isn’t alone in this space. The entry hall holds a shelf filled with free books, a bin piled high with free clothing, and a bulletin board with information on volunteer opportunities and scheduled events. The sanctuary, chapel and two large halls are used for conferences, music programs, plays and movie screenings. Smaller spaces house offices and host small group meetings, common meals and a variety of other peacemaking activities. Twice a month, a drumming group gathers at the center to explore rhythm as a spiritual practice. On work days, volunteers come and fix up the aging facility. Conceived more than a decade ago by a church struggling to envision its future, today the center is both a physical space and a network of 40 local nonprofit organizations, all committed to promoting peace, curbing violence and advancing social justice in Oakland and the San Francisco Bay Area. 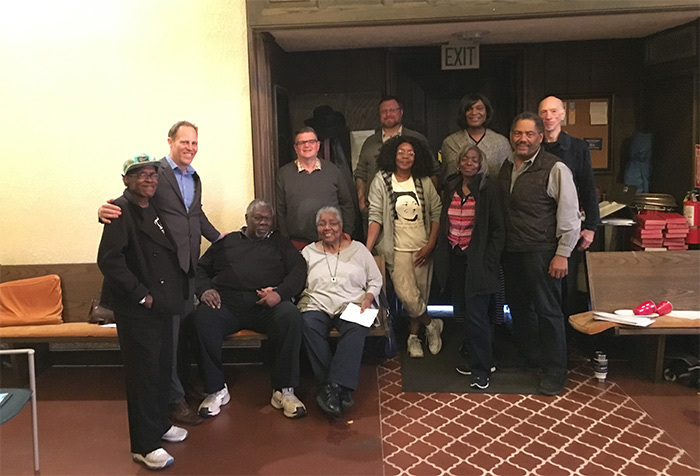 Members of First Christian Church of Oakland with the Rev. Monica Joy Cross (back row). The original congregation -- which numbered 1,500 at one time -- now has a half-dozen people in Sunday worship. Yet it has been given new life, and its impact is significant: last year, the center’s partners served 86,000 people. What forms of ministry might your organization undertake that don't resemble what you're doing today? Ernie Fields, a church trustee, said he is excited about the new direction for the congregation to which he has belonged for more than 60 years. More than just a building with a collection of tenants, the Oakland Peace Center is structured to foster collaboration among its member organizations. The definition of “peace” is broadly construed; while some organizations work directly to combat violence, others have a wider mission. 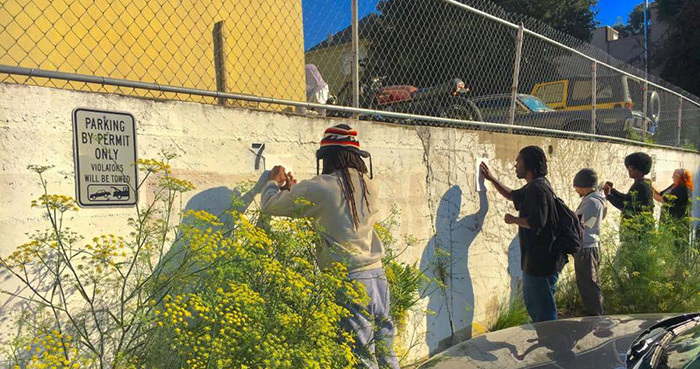 Volunteers prepare to paint a mural on a wall in the center's parking lot to send a message of peace as people enter the space. Some of the center’s agencies provide direct services to individuals. Others work toward policy or cultural shifts in society. Still others emphasize the value of cultivating inner peace through practices such as yoga and meditation. The “peace partners” co-sponsor events, share strategies and resources and organize trainings. Twelve nonprofits rent space, and roughly 30 more affiliate with the center out of a sense of shared vision. “This building is a place of synergy where we’re all in it together, working to strengthen each other,” said Angela Urata, a center board member and the operations director of the partner Niroga Institute, which is focused on yoga and meditation. Jha, 42, is a warm-hearted woman with a ready smile who has a background in community organizing and political engagement. Her mother is Scottish Presbyterian and her father Hindu. Born in England and brought up in Akron, Ohio, Jha was ordained in 2005 in the Christian Church (Disciples of Christ). Jha, who holds both an M.Div. and a master of public policy degree from the University of Chicago, accepted the post. She was the congregation’s first nonwhite pastor, and was eager to help them move into a new chapter. That dilemma no doubt would have been incomprehensible to the congregation in its heyday. At one time, the church had more than 1,500 members. Established in 1876, it moved in 1929 into the building on Fairmount Avenue, which was designed by well-known architect W.H. Weeks. The Spanish-style building with multicolored tilework and a white tower featured 11 beautiful stained-glass windows that still gleam in the vast sanctuary. As the decades passed, the neighborhood and the congregation changed. Once all-white, the church slowly integrated as the demographics of the neighborhood shifted. Some members moved away. Some newcomers to the neighborhood belonged to churches elsewhere. Some younger people rejected their families’ religious traditions, and older members died. When Jha arrived, the church had about 20 members. It grew under her leadership, but still faced challenges. The building had become too large for the congregation, and too difficult to maintain. Members of the church’s men’s fellowship took care of the maintenance, said Fields, a retired broadcast engineer whose family was one of the first to integrate the congregation. If you are struggling to keep up your physical plant, could you turn it from a burden into an asset? “We ran a tight ship, but over time we had fewer people, and upkeep was a struggle,” he said. In 2007, Jha organized a visioning retreat to discuss the congregational identity. At the time of their retreat, First Christian Church members were praying every week for neighbors in prison or those lost to or affected by violence in the neighborhood. The issues of violence and peace were not an abstraction; the time felt right to assess their role in the congregation’s mission. The 15 participants discussed how the church might serve as a hub or incubator of peace -- a space where peace might radiate out into the surrounding community. 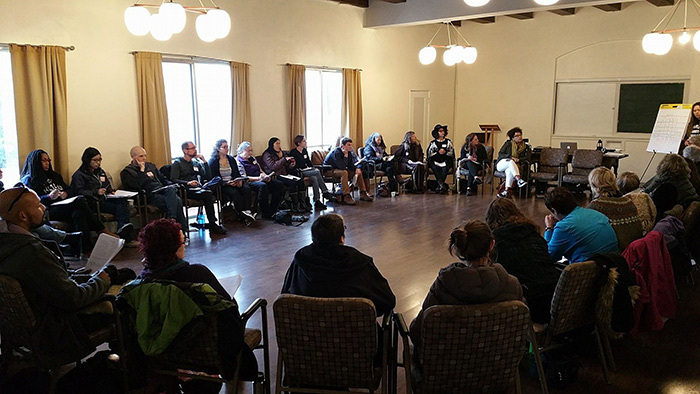 At the retreat, the congregation also established criteria -- still in effect -- for all potential tenants and other members of the Oakland Peace Center. They decided that vision would take the form of creating the hub for peace in the building. That included offering nonprofit community service organizations low-cost office space. After decades of white flight, Oakland was beginning to struggle with gentrification. 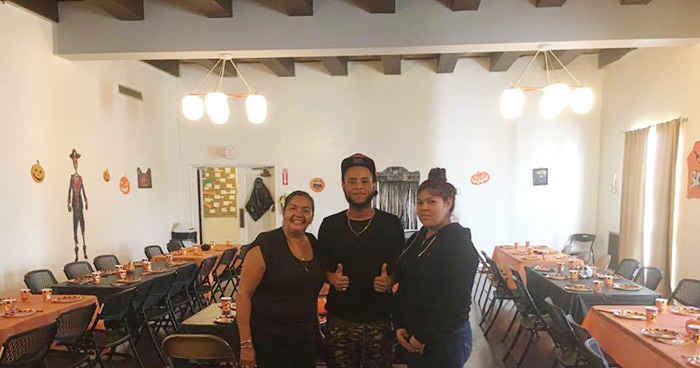 That struggle continues; at a time when many nonprofits are being forced out of Oakland by office rents as high as $50 a square foot, the center charges in-house partners only $1 per square foot. What is the primary issue facing your community? Could you build your ministry around it? Fields recalls that while outreach has always been part of the church’s mission, the idea to bring in nonprofit organizations did not sit well with everyone at first. Fields’ daughter, Aimee, then a teenager, was instrumental in helping move the idea for the center forward, and today she serves on the board. The East Point Peace Academy holding a nonviolence conflict reconciliation training based on the teachings of Martin Luther King at the Oakland Peace Center. In 2009, the congregation determined that the center would be the primary work of First Christian Church. The official launch was held on Martin Luther King weekend in 2012, with 25 peace partners on board. As the center has evolved, the relationship with the church has shifted. Once the center received 501(c)(3) status, the church could act as an equal partner within the organization rather than simply as landlord. Three years ago, the congregation decided to place the building in a trust with Disciples Home Missions, a general ministry of the Christian Church (Disciples of Christ). That process continues; when it's complete Home Missions will lease the building and the land to the center, while guaranteeing the congregation a place to worship. What existing institutional structures could help you achieve your aims? In 2013, Jha stepped down as pastor to concentrate on her role as executive director of the center, and a year later Cross became pastor of the congregation. Originally a congregant, Cross is a transgender activist, social justice advocate, writer and speaker. She has an M.Div. from the Pacific School of Religion and is a graduate of Starr King School for the Ministry. Cross works part time for First Christian Church; she also serves as an associate minister at Tapestry Ministries (Christian Church [Disciples of Christ]), as founding minister of the Global Prayer Network, as founding minister and CEO of the nonprofit A Different Imagination for a Just and Sustainable Humanity and as a transgender clergy consultant. Cross leads the congregation of about 20 members, ranging in age from 24 to 90. Despite the small size, the congregation is seeking to make a difference, she said. “They are forward-leaning, risk-taking individuals, still finding justice issues to work on. It is a joy to minister to them,” she said. Project Darreis, a nonprofit founded by the mother of a young man killed in Oakland, offers a Halloween party for children who might not feel safe trick or treating in their neighborhood. Volunteers fill their trunks with candy and park in the center's lot so children can "trunk or treat." A decade after it was first envisioned, the center is living into the vision. Fields’ son Daniel described it early on as “an epicenter of peace” -- a powerful metaphor for people familiar with earthquakes. One recent morning, for example, the in-house partners met to discuss how to protect immigrants they work with, as well as new strategies for capacity building this year and next. The center has recently hosted peace-promoting theater performances, book readings, discussions and a Law for Black Lives conference, held in February. Has this work made a difference? "Call me in 50 years," Jha said. Violence has decreased since the center opened, though Jha is does not claim credit for that trend. Oakland’s rate of homicide and other violent crime has dropped dramatically, but its homicide rate is still four to five times greater than that of the rest of California; last year, the problem was pressing enough that the city created the new Department of Violence Prevention. And recently protesters gathered outside the district attorney's office to demand she file charges against a transit officer who shot Sahleem Tindle to death at an Oakland BART station in January. The work of the Oakland Peace Center is a culture shift, she said, with a much longer trajectory: "We're at the very beginning of the work." Are you willing to "listen to the needs of the community and to check your fears and ego at the door"? Some folks have taken part in the center’s mission in multiple ways. Clidell “Franceyez” Jackson, who was helped by some of the center’s agencies when he was younger, co-founded one of the early partners -- United Roots, an organization that “engages and empowers marginalized youth in socially innovative ways” -- and is now the center’s facilities coordinator. A former professional basketball player, Jackson coaches the youth basketball team at the First Mongolian Christian Church, a program he hopes to expand as yet another way to spread peace. For Jha, the work of the center stems from the work of a small group of people willing to embrace a new way of being the church in the world.